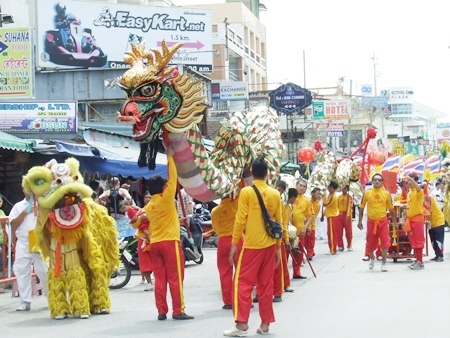 Dragons danced through the streets as thousands of people dined on “dumplings with heavenly ingredients” as the annual Pattaya Vegetarian Festival stirred up Thai-Chinese citizens and tourists alike. 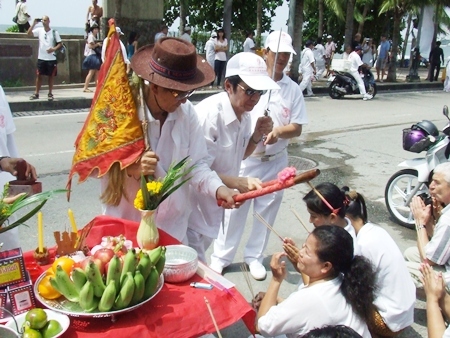 Mayor Itthiphol Kunplome lights some incense to summon different deities to impress upon the festival. 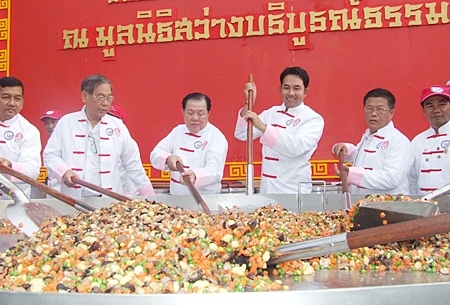 The dish – made of natural ingredients, including 200 kg of jasmine rice, 100 kg of brown rice, 60 kg of mushrooms, 60 kg of gingko, 60 kg of kaoluk, 50 kg of lotus seeds, 60 kg of cashew nuts, 400 kg of white tofu, 40 kg of jujube, 100 kg of carrots, 100 kg of peas, 30 kg of seasoning sauce, 7 kg of salts, 100 kg of brown sugar, 5 pails of palm oil, and 50 kg of organic rice – was passed out to thousands of revelers, many dressed in white to honor the end of the Buddhist Lent season. 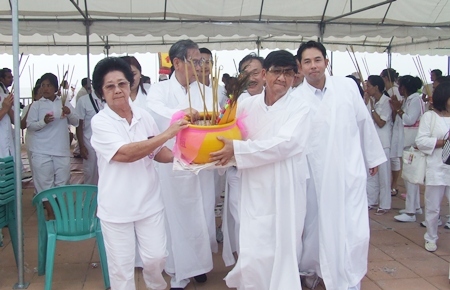 Leaders carry the ceremonial incense pot into the holy ground to pay respects to their deity. Before they could eat, however, they had to march. 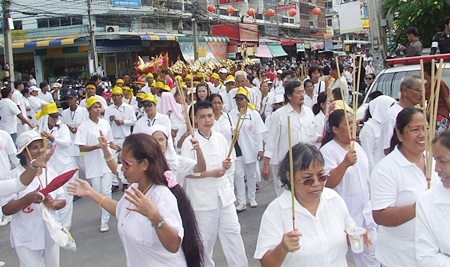 The annual dual-headed procession consisting of “Kiew Huang Huk Jow” (the 9 Deities who are the spiritual mascots of this year’s vegetarian festival) and “Bodhisattva” (also known as Chow Mae Kuan Im, the Goddess of Mercy, Compassion & Healing) kicked off at 12:29 p.m. at Bali Hai Pier and proceeded up Walking Street. 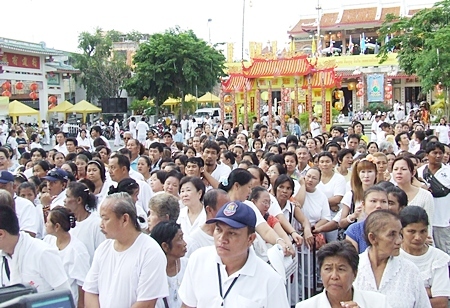 The Vegetarian Festival parade in Sattahip draws many participants. The parade group then split, with half following Beach Road to Central Road and turning right. 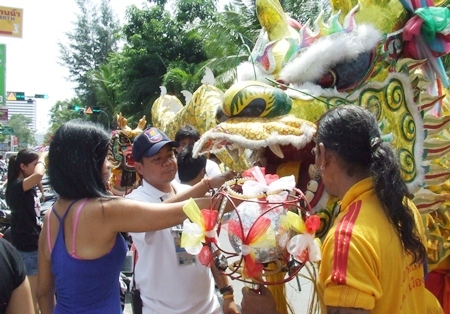 The second branch traveled along Second Road, stopping at Mike Shopping Mall for a dragon show, then met the first group at Central Road. 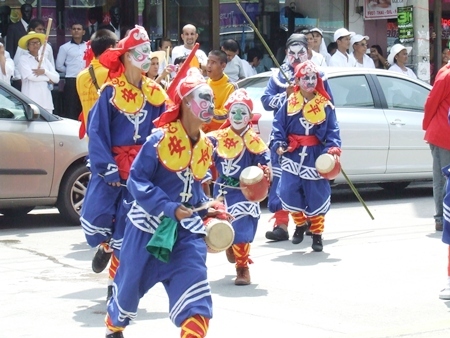 Reunited, the groups moved to Third Road and then jumped on buses to go to the Sawang Boriboon headquarters. 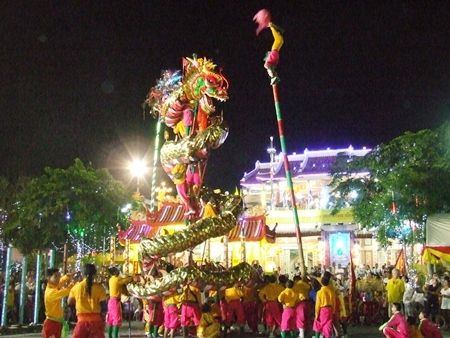 Activities also played out on Walking Street in the evenings, with more than 50 food stalls, games and stage performances. Following evenings saw a magic show, a performance from Thummawathi School, and traditional Chinese opera played out by children. 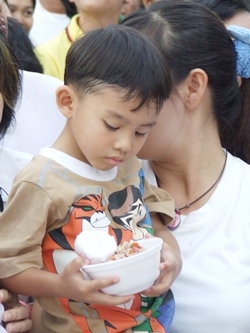 While Pattaya’s Vegetarian Festival was the largest in the area, it wasn’t the only one. 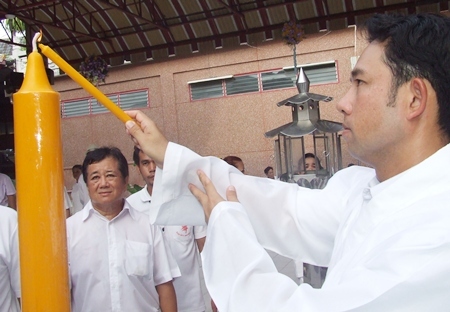 Chonburi Deputy Gov. 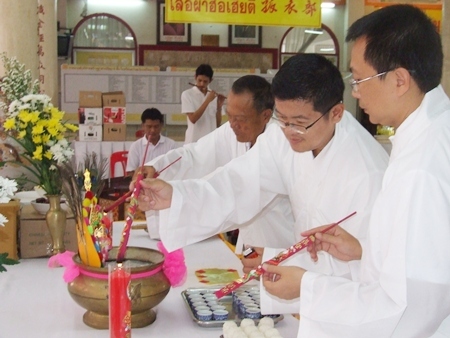 Phakthorn Thienchai welcomed revelers to the Paohektua Vegetarian Hall in Chonburi on Sept. 27 and offered both free accommodation and food to celebrants. 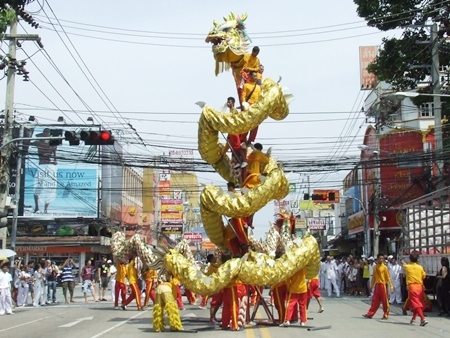 In Sattahip, Mayor Narong Bunbancherdsri led a Chinese deities parade through the city to kick off that area’s festival. Deputy Mayor Verawat Khakhay (center) helps plant the 9 sacred ingredients. 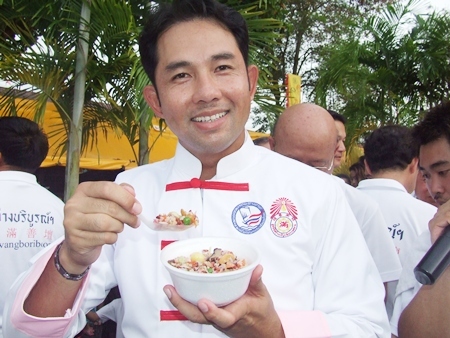 The mayor steps in to help members of the Chef Association of cook the ‘8 masters Yaadthip fried rice in giant pan’. 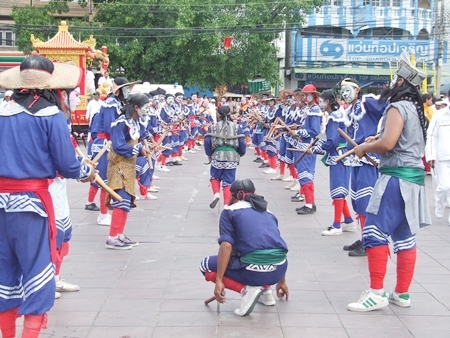 Eng-Kor-Pabu troops from the Look Praya group out of Nakorn Sawan perform at the Sawang Boriboon Thammasathan Foundation in Naklua. 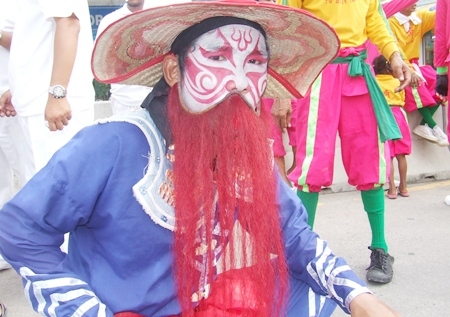 An Eng-Kor-Pabu (traditional Chinese fighter). 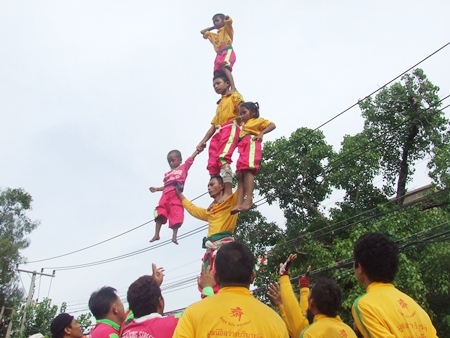 This human pyramid raises the children high into the sky. 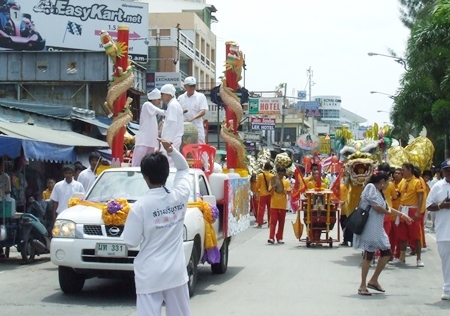 The parade winds its way through the streets of Pattaya. 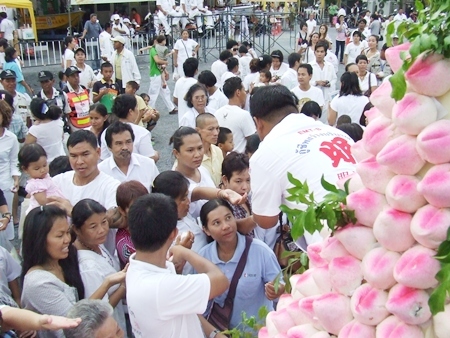 Business owners and residents who have put out worship altars along the parade route, present garlands and receive blessings for prosperity. 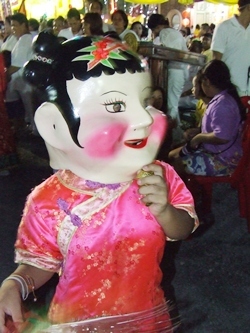 ‘Pae Yim’, also called ‘Sim Hua Roa’ or the Laughing Aunty, is a permanent fixture during Chinese type holidays. 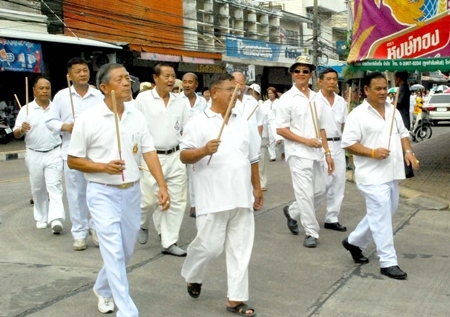 White clad participants in the opening day parade make their way through the streets. 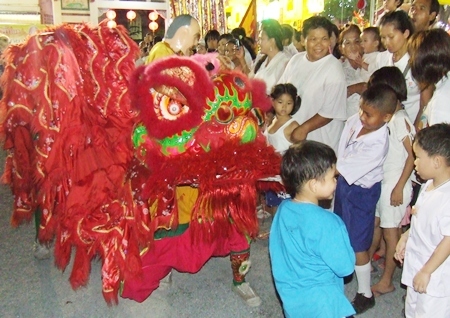 A ferocious red lion excites the youngsters during the festivities. 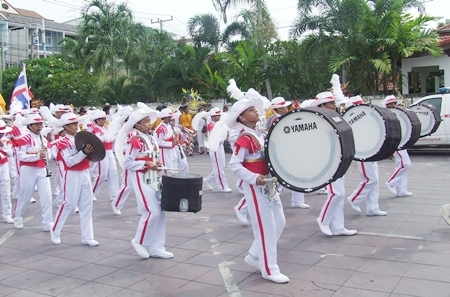 No parade is complete without a talented school marching band.